Who Says HDRs Have To Be Colourful? San Francisco Landmarks, originally uploaded by DaveWilsonPhotography. So much of the HDR-derived imagery you see (or, at least, so much of it that you notice) is colour that people tend to associate HDR in general with gaudy, oversaturated pictures. 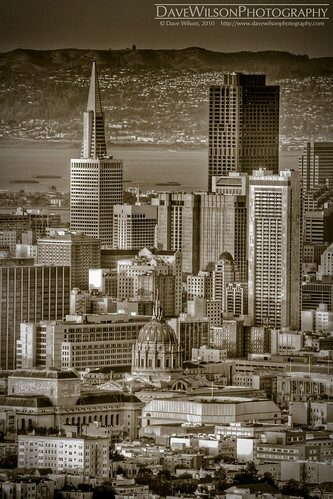 That’s definitely not the way it has to be, however – HDR techniques can be used to generate fabulous monochrome images too. A couple of my all-time favourite pictures fall into this category (my Chevron Tower shot and one of the first stage engines on a Saturn V) and here’s another from last week’s trip to California that I am also very pleased with. Next time you are processing an image that is strongly geometric or which works predominantly due to shapes and textures in the composition rather than colours, try doing a monochrome version and see how it turns out. You can either move the Photomatix Saturation slider all the way to the left while tone mapping or, probably better, tone map as normal then use Lightroom or Photoshop to generate a monochrome version of the result (they offer far more flexible options for downmixing a colour image to a black-and-white one).